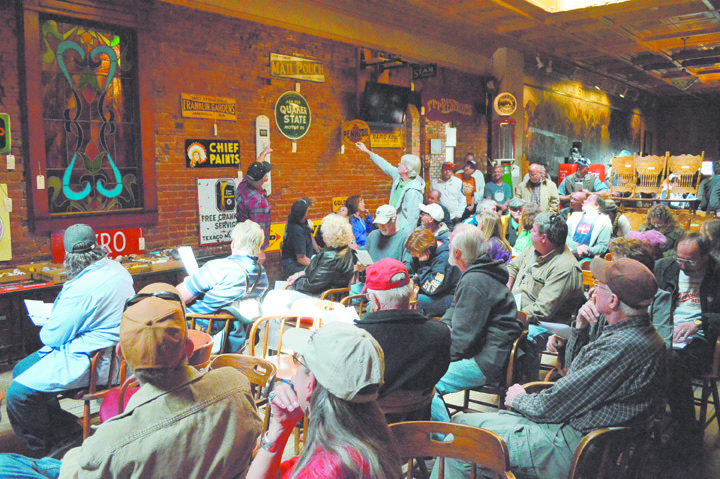 Auction of antique items at Buffalo Restaurant in October, 2014. One of state’s most popular eateries for decades, Idaho Springs’ Buffalo Restaurant & Bar, is in the midst of a complete renovation and redesign. If all goes as planned, when it reopens in late May it will be like you remember, only completely different—the same Buffalo, and more. 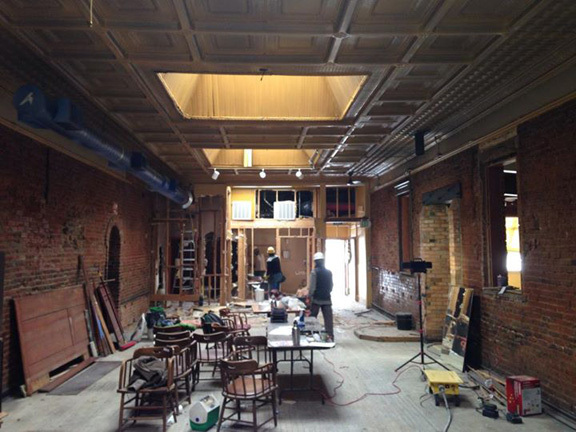 “The main part of the restaurant will keep its feel,” Ebert explained. “It will still be the Buffalo restaurant.” The menu, however, is going to shrink. They will still offer their famous buffalo burgers, but the food will evolve from previous options. Ingredients will be all fresh products, nothing frozen. There are plans to fill the kitchen with state-of-the-art equipment that can do some “amazing” things. “I’m excited to see how the kitchen evolves, and how its been evolving,” Ebert said. “It will make things a lot easier on the staff.” With just a few more staff, the manager explained they will be able to put out 40 percent more product than what they currently do. A new computer P.O.S. system and better kitchen design will also help make things more efficient. In addition to the Buffalo everyone remembers, the western portion of the business will be turned into the West Bound & Down Brewery. “We’re going to have two different angles going on,” Ebert said. “On this side of the wall, for someone who doesn’t know, they will think it’s a completely different restaurant. It will have different name, it will have a different feel to it.” He said it will be more of a modern design with different lighting and menu. “There will be two different feels of the restaurants, two different types of service,” he said. “It’s more of a come-in-and-grab-a-beer and hang out with friends place.” Patrons will order food from the bartender and food runners will deliver it. The brewing system is all American made and comes from Oregon. It will be only the third of its kind in Colorado. According to Ebert, the renovations to the restaurant are extensive, including a new kitchen design with all new equipment, a new HVAC system, new bathrooms and plumbing, new booths and chairs and more. They are tearing out the old bathrooms, fireplace and office. “We’re designing a kitchen that will be geared toward the volume we see in Idaho Springs. Ideally, the volume we’ll see grow in Idaho Springs down the road.” The manager—who says he didn’t sleep well for years worrying about a fire starting in the more than 40-year-old stove hood—expects the new kitchen to be able to handle up to 1,400 meals on a busy day. He also explained the overall environment will be better for employees and customers. “We’ll actually have heat that is designed to heat a restaurant,” he said. 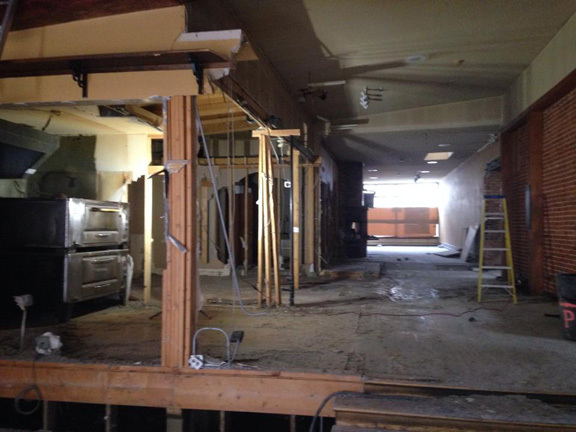 Some of the renovations include tearing down the wall where the antique bar was located and turning the bar 90-degrees to face the front door, which will be relocated as well. “We’re going to build on to that bar, match it and increase the seating capacity by 7-8 people,” Ebert said. They will also add 8-10 new booths “that are comfortable, and easy to keep clean.” The lighting will be upgraded, too. They will be doing some work on the exterior that will return the building to more of the historic look on the Miner Street side. The pub will feature sliding garage doors that will open up the place in warm weather to let “the outside in.” A rooftop deck has also been incorporated into the pub side and is expected to be completed and ready for use by 2016. The idea is to prepare the building now, and just drop the deck on top when the time comes. “One of the things I’m most excited about is Dan’s office,” Ebert said. Instead of being tucked away in the back, the manager will now have windows that faces the line, the dining room and the back door where he says 95 percent of a restaurant’s problems occur in those areas. “It will make things really efficient I’m really excited about that,” he said. The need to renovate the Buffalo has been growing for years. More and more people are coming to town to take advantage of the area’s attractions and most need to get out in an hour. Many places in town, including the Buffalo can have a 30 minute wait for a table on busy nights. “We could have served an extra 200 meals, if we had the capacity,” Ebert explaied. “That 200 meals translates into almost $4000 of lost revenue. If you can get people in and out quicker, it works better. That’s part of why were doing this, to have that quick service. The patterns of business in Idaho Springs have also changed in recent years. Restaurants in the town used to do about half of their business before 5 p.m. and half after in the 90s. Copper Mountain, Keystone and Winter Park weren’t developed like they are now. “When you got done skiing, there weren’t 20 restaurants to choose from and much of the current lodging didn’t used to be there. Now, 60-70 percent of business can occur before 5 p.m. “Some times of the year we will literally do 80 percent before 5 p.m.,” Ebert said. Tags: Buffalo Restaurant, Idaho Springs. Bookmark the permalink.